Overview: The Ladakh Holiday always takes you away to the Highlands and tranquil land of the lamas, Lakes, Passes. This trip is for those who choose to visit Ladakh on a more relaxing holiday, visit to the popular sights at a leisure pace is a part of the itinerary, Pangong lake the high light of a Leh Ladakh holiday is a must visit jeep safari excursion. On this trip you will get a good experience of a Ladakhi Holiday where exploring at a leisure pace with inside visits to the Palace, Monasteries and Lakes. All the nights are in Leh. Arrive Leh; 3505 meters / 11567 feet. Arrive Kushok Bakula airport Leh – 3500m above sea level. Transfer to hotel. Breakfast at the hotel before 09.30 am. Half Day at rest for acclimatization. After breakfast, carry packed lunch for the day. Sightseeing of 1000 year old Alchi monastery the only Gompa in Ladakh region on flat ground. Thereafter proceed to the Likir Monastrey to visit the splendid three storeys Dharma Wheel Gompa. Here you’ll be awestruck with the sight of the massive Buddha statues., Indus & Zanskar river Sangam, drive along the Indus river visiting, Pathar Sahib Gurdwara and Magnetic Hill (where the cars defy gravity), Basgo Palace Hiking only and further on to Leh Hall of Fame (which has a museum of the Kargil War memorabilia) Dinner and Over Night at the Hotel in Leh. Tour of Khardungla Pass 18380 Ft. Nubra Valley and Hundur Sand Dunes – Drive 120 Kms 4/5hrs After Breakfast drive to Nubra Valley via Khardungla (Highest Motorable road in the World, 18,380 ft) Arrive at Hundur by Afternoon. Rest of the day, Post lunch free to explore Deskit, Hunder Villages and camel Safari in Sand Dunes between Deskit and Hunder Village. Overnight stay at the camp. Tour of Pangong Lake- It is the highest land locked lake (155 Kms on way from Leh 04 Hrs driver each way. After an early breakfast we leave for Pangong Lake through Changla pass 5486 Mtrs. Pangong Lake, situated at 14,000 feet (4,267 m). 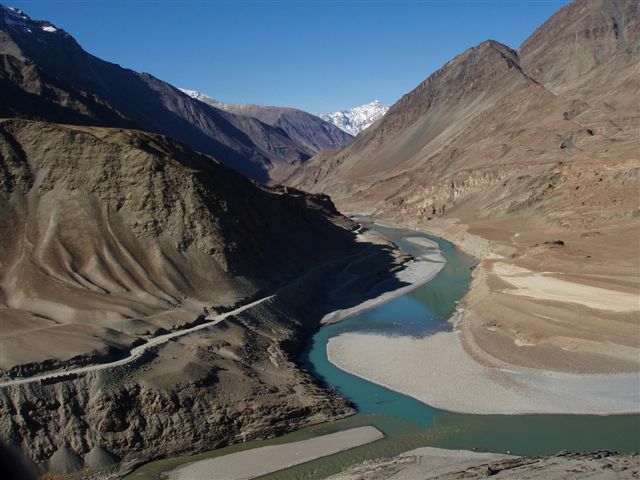 A long narrow basin of inland drainage, hardly six to seven kilometer at its widest point and over 130km long, it is bisected by the international border between India and China. A few years back the government decided to open it to tourists though the lake and its surrounding is under army surveillance. Enjoy the landscape in the back drop of the Lake. One rarely feels so close to nature and environment and the scenery is unforgettable. Drive back to Leh. Overnight Night at the Hotel in Leh.